April 1, 2012 -- After a lackluster Saturday of qualifying, the Torrence Racing/Capco Contractors Inc. Top Fuel dragster crew scoured the parts and pieces and discovered a few unwanted glitches. They soon were eradicated and the results were very evident Sunday when Steve Torrence advanced to the semifinals of the SummitRacing.com Nationals. “We stubbed our toes a bit Saturday (when the car didn’t go down the track on either run), but we definitely came through that adversity and ran really well on race day,” said an elated Torrence. 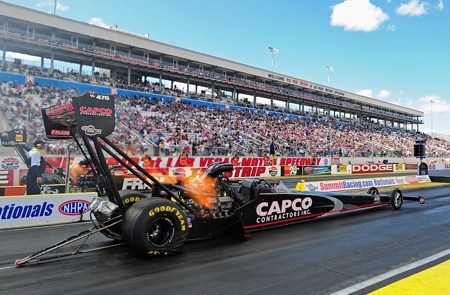 Torrence covered The Strip at Las Vegas Motor Speedway’s 1,000-foot track in 3.823 seconds at 319.82 mph while Massey got the win light with his 3.830 at 322.04. Massey came back to take home the winner’s trophy. After qualifying 11th in the team’s seventh race, Torrence ousted Bob Vandergriff – 3.818 seconds at 321.35 mph to 3.932 – to move into the quarterfinals. He left the line first against David Grubnic and stayed there, winning on a hole-shot, 3.823 at 319.82 to 321.19.